Centuries from David Lloyd and Graham Wagg allowed Glamorgan to set Kent a target of 187 for victory after a determined fightback on day three. 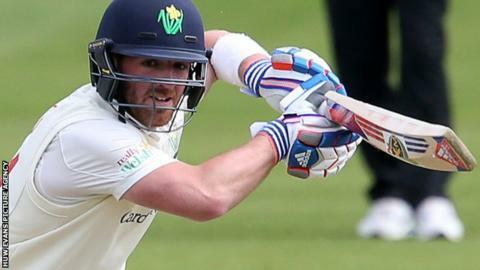 Lloyd's 107 was his maiden Championship hundred, while the pair's stand of 215 was a Glamorgan record for the sixth wicket against Kent. Darren Stevens finished with 4-79 as Kent mopped up the last five wickets with the new ball. Kent reached 22 without loss in the final six overs to remain favourites. Stevens was again Kent's most-used bowler despite turning 40 on the eve of the game. The stand between Lloyd and Wagg beat the previous best sixth-wicket partnership of 206 between Jim Pressdee and Alun Rees at Maidstone in 1964. "This is a really good pitch. There's a little bit in it if you bowl well. We bowled a little wide early on, but the way Wagg and Lloyd played, they dug in and took it to us. They played brilliantly. "We said that the second new ball was going to be crucial for us and we needed to bowl straight and it actually worked nicely for us. "The way the openers (Daniel Bell-Drummond and Tom Latham) are batting, it looks like they've been playing together for years. They look good so fingers crossed they can stick in and get it done as soon as possible." "It's amazing to get over the line and finally get a hundred in a Championship game. I'm delighted. It was down to the help of Waggy to keep me going. "Anything there to hit we tried to take advantage. We got to a decent total. We'd have taken that at the start of the day and we'll see if we can get some early wickets." "We'd been out of the game and they'd won every session. So, with them having 160-odd still to get, we're still in the game. "Although it's going to be a tough ask to bowl them out, each and every one of us in that dressing-room is capable of 40% more."